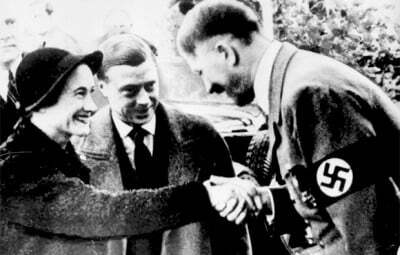 The Duke and Duchess of Windsor in 1937 with Adolf Hitler. Dr. Jacques Pauwels is not the kind of historian you often hear about in the mainstream media. He’s obviously not the kind of “expert” they refer to for historical facts. Actually, one crucial propaganda method consists in excluding current events from their historical context. Listening to Pauwels makes one realize the scope of the lies we’ve been fed about the Second World War, fascism and democracy, and how myths related to previous wars need to be upheld in the mainstream discourse to satisfy never ending war propaganda needs. In a speech held December 15 in Montreal, he explained that World Wars I and II were all about crushing mass revolutionary movements. Every time Westerners’ approval for war is required, the myth of the good war surfaces: the Second World War was a good war, a necessity to quench Hitler’s blood thirst. Pauwels tears this myth apart, uncovering the vicious nature of the western elite. The reasons for the US involvement in World War II lie in the social-economic conditions of the time, not in an outpouring of compassion destined to save humanity from fascism. The US elite was actually in favor of fascism, a very convenient tool to crush the mass revolutionary movement embodied by the Russian Revolution and the USSR. 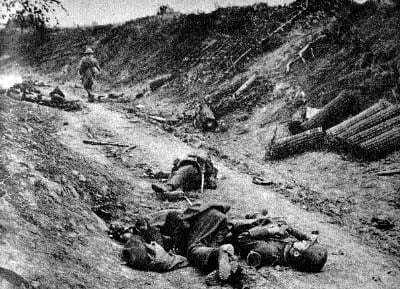 Both WWI and WWII had two dimensions: the vertical dimension, namely the rivalry between empires, and the horizontal one, class warfare, Pauwels explains. These wars were actually the best way for the western elite to cope with the ever growing revolutionary and democratic movements fueled by dire economic conditions and which threatened the established order. According to popular belief Western leaders were defending democracy, engaged in a war against Germany to save humanity from fascism and the US involvement in the war led to the downfall of Hitler’s war machine. Nothing is further from the truth. “Hitler was supported by other European countries and the US because they wanted him to destroy the USSR, the cradle of the revolution.” The exact opposite occurred: it was the USSR that defeated Nazi Germany, losing over 20 million souls in the battle. The US even recruited the best Nazi scientists, technicians and engineers to work for them after the war. That piece of history called Operation Paperclip (picture below) has yet to find its way in Encyclopedia Britannica. 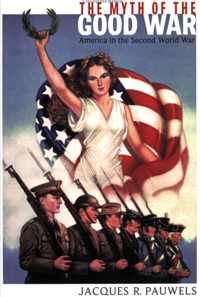 WWII was the victory of American Imperialism, a term which is rarely used today even if it best describes the reality the world has been living in ever since. But even more surprising is the surviving myth that we are going to war to save the world from evil dictators or terrorists and that the western world fights for freedom and democracy. Thanks to the “stenographers of power”, the tactic is still reliable and used several decades later. Visit Jacques Pauwels web site at http://www.jacquespauwels.net/about/. His articles and books are available in several languages. See also Jacques Pauwels’ articles on Global Research.